When we purchased the property in January 2015 it had been abandoned for nearly 15 years. In the above photo you can see that blackberries had nearly overrun all 30 acres, burying several old structures completely. The second photo is the same view over a year later. By that time we had remodeled the small house, torn down the garage, built a new barn, and removed acres of blackberries. These are historic photos of the old barn and hayloft. Sadly, this barn didn't survive 15 years of neglect and collapsed sometime before we took over the property. The tractor on the left is a 1938 McCormick Deering W-12 that came with the farm. She hasn't run since they drove her into the equipment shed 20 years ago. 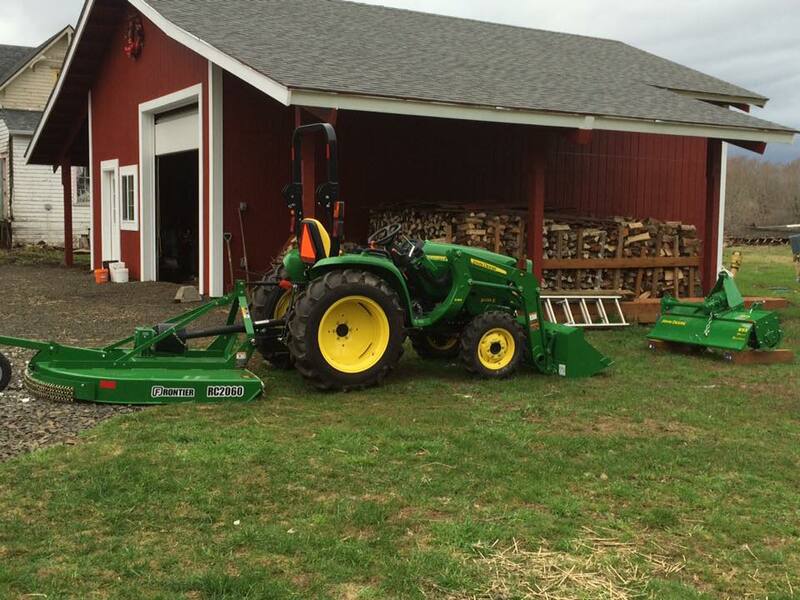 On the right is the new John Deere we bought until we can get the McCormick up and running again. Shortly after finishing the small house we realized we needed a little more storage space. This barn now houses a propagation room for flowers and vegetables, as well as an area for the chicks and ducklings before they are ready to live outdoors. Here are more photos of the upgrades made to the property. Note the 7 foot fences around all of the produce fields. Because of the local elk herd everything needs to be overbuilt and very robust. The farmhouse was overrun with blackberries and honeybees when we first showed up. The original house never had indoor plumbing. A sauna and outhouse fulfilled everyone's needs. Eventually an apiarist came out to remove the colony of bees from the house. It was a great improvement. You can still see the old barn and the remnants of the original garage. Plus a lot of blackberries. The house pretty quickly got a new roof to prevent additional water damage. One of the largest single projects on the farm will be the restoration of the main farmhouse. Originally built sometime around 1900 from supplies brought in by river boat, we are committed to maintaining the original style and Finnish heritage of the house. Built of old growth cedar, the house is still remarkably stable considering all its been through.